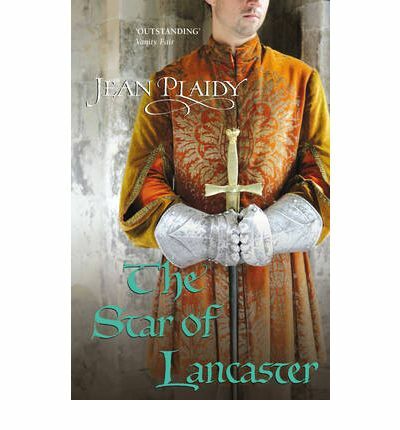 One of the idiosyncrasies of Jean Plaidy’s writing is her style of encompassing mini-stories within the main story, weaving them all together. This she has done with The Star of Lancaster, covering an aging John of Gaunt, his rising son, Henry IV of England, and the short lifetime of the great soldier-king, Henry V.
As usual the story covers a handful of women close to male protagonists: Mary de Bohun, wife of Henry IV and mother of Henry V; Isabella of Valois, Queen of England and second wife of Richard II; Joanna of Navarre, Queen of England and second wife of Henry IV; Isabeau of Bavaria, Queen of France; and Katherine of Valois, Queen of England and wife of Henry V. These characters take us through Richard II’s disastrous reign, Henry IV’s shaky one, and Henry V’s triumphant, but tragically brief stint as King of England (and France). During the decline of Richard II, Mary de Bohun was a young heiress under the wardship of John of Gaunt. She was being pressured to go into a convent by her greedy elder sister and brother-in-law, Thomas of Woodstock, Duke of Gloucester, who wanted the entire de Bohun fortune instead of half. John of Gaunt, interested in the fortune himself, contrived a meeting between Mary and his eldest son, Henry of Bolingbroke, and the two were fortunately fond of each other. They married at a very young age to secure Mary’s fortune, though their heir was not born for another 8 years. While Mary was busily having one baby after another, Henry was actively looking after his father’s lands, and following the court. He found himself involved in several intrigues against the king, finally ending in a decade long banishment from England. While staying at various houses in France, he met Joanna (then Duchess of Brittany), who would become his second wife and Queen of England several years later. Harry of Monmouth (the future Henry V) meanwhile is growing up, and has always been a strong-willed and adventurous child. He was admired by many, because he mingled with the lower classes, and displayed strength and cleverness in dealing with every situation. He was ambitious and very much aware of his father’s tentative claim to the throne. When his father deposed Richard and accepted the crown, Harry began planning for the day he would become King of England. This story covers Henry V’s glorious battle at Agincourt, and his clever decisions as King of England. His one-time friend and fellow tavern companion, John Oldcastle, plays a small role, involving himself the on-going religious movement of the Lollards. This novel, like many of the Plantagenet Saga, is long and features many characters with detailed back stories. It will appeal to Plaidy fans, of course, and those interested in the intricate history of the Wars of the Roses, as it covers the early quarrels of Edward III’s sons and grandsons.